lower right in brown ink: A. van Dyck; in later hand, across bottom in brown ink on mount: A. Vandick; upper right on mount: 919; upper center verso: P.49. / 21. / [L? ]g.101 / L.9. / 6. P. H. Lankrink (Lugt 2090); Jonathan Richardson (Lugt 2183); Thomas Hudson (Lugt 2432); Sir Joshua Reynolds (Lugt 2364); The Earls Cowper; Lady Lucas; Mrs. Spencer Loch; (sale, Christie's 1 July 1969, no. 68); (Thomas Agnew & Sons, Ltd.); purchased by National Gallery, 1970. NGA Master Drawings 1978, p. 61. 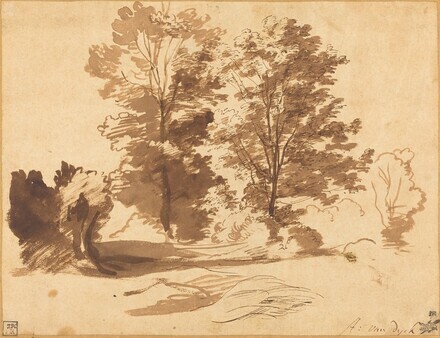 The Light of Nature: Landscape Drawings and Watercolours by Van Dyck and His Contemporaries, Rubenshuis, Antwerp and The British Museum, London, 1999, no. 8. Walker, John. National Gallery of Art, Washington. Rev. ed. New York, 1984: 672, no. 1072, color repro. Cornet, Pascal, et al. Van Dyck: Guide illustré pour les expositions. Antwerp, 1999: no. 8.